Some further application of pressure around the case allows it to open fairly cleanly – actually quite a bit of pressure, carefully, over a period of about ten minutes. Iʼm still not sure whether it was glued or what. It may not have been necesssary to cut the strain-relief. 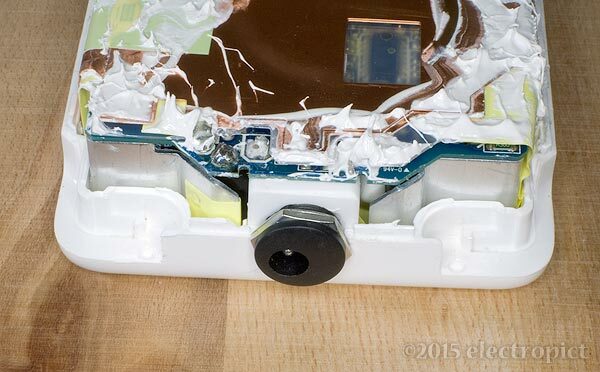 Inside the case there is what I assume is thermal transfer paste, which may also act as non-setting glue. Messy. 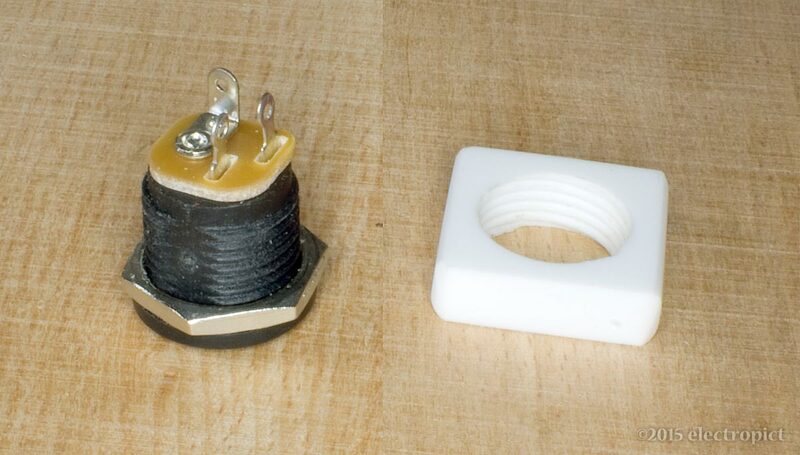 The strain-relief block seems to be co-moulded with the cable in it. This is a major improvement on the original PSU with this MacBook. Ainʼt no way in California this sheath is going to pull out and expose the conductor. (A belated round of appreciation for that conceptual improvement ... though, obviously, the implementation is so poor Iʼm now cutting it out to avoid the annual replacement expense... '~' ) Inside the block, both wires are sheathed (ground in black), and thereʼs not much of them. I cut them as close to the block as possible. Thereʼs not much space inside. 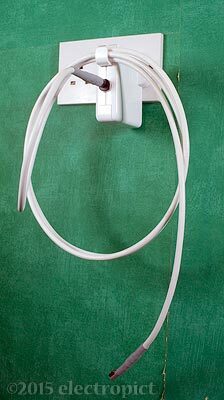 The remaining wire could, in principle, be connected direct to the new flex, but providing adequate strain relief and sheath clamping would be difficult. A socket sidesteps the question neatly. Iʼd prefer a socket anyway, especially as the new cable is too thick to wrap round the built-in hooks for storage. 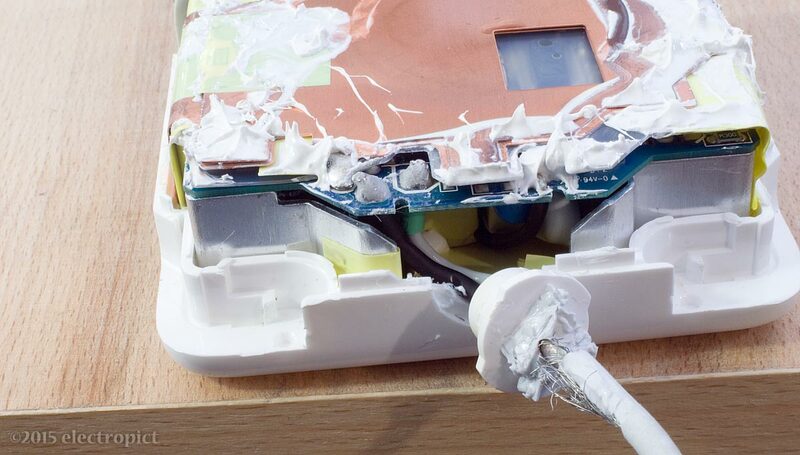 Apple should have used sockets from the start, as Iʼve said in various places over the last few years. Homo sapiens pernickitens I may be, but Iʼd not be too worried by replacing a fraying cable every year or two, so long as I didnʼt have to pay £130-odd for the PSU every time. 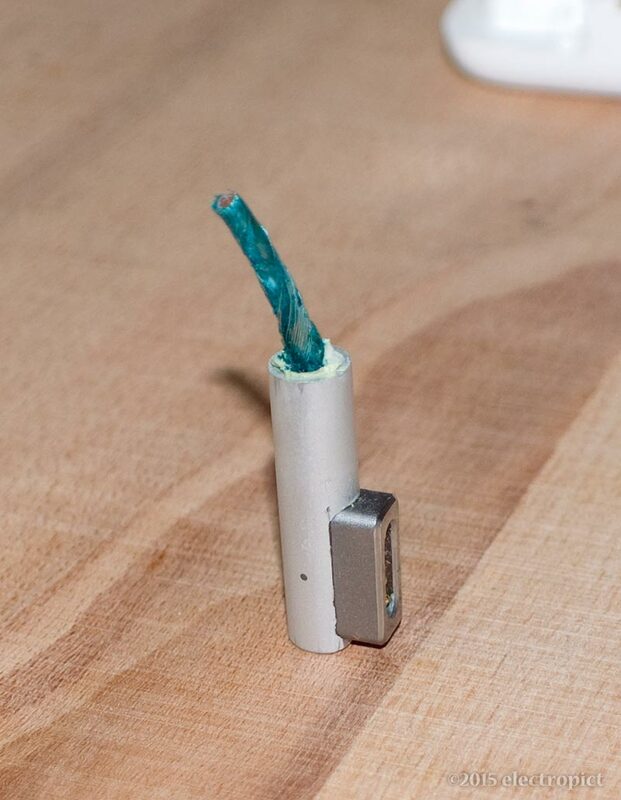 Even if it was an own-brand connector, of a radical new design that resists accidental disconnection, and keeps third-party manufacturers at bay for a few weeks. If it was just affordable and tolerably well-constructed. What Iʼm about to do will not be all that well-constructed – because getting exactly appropriate bits is difficult when you canʼt order them bespoke, in six- or eight-figure quantities. 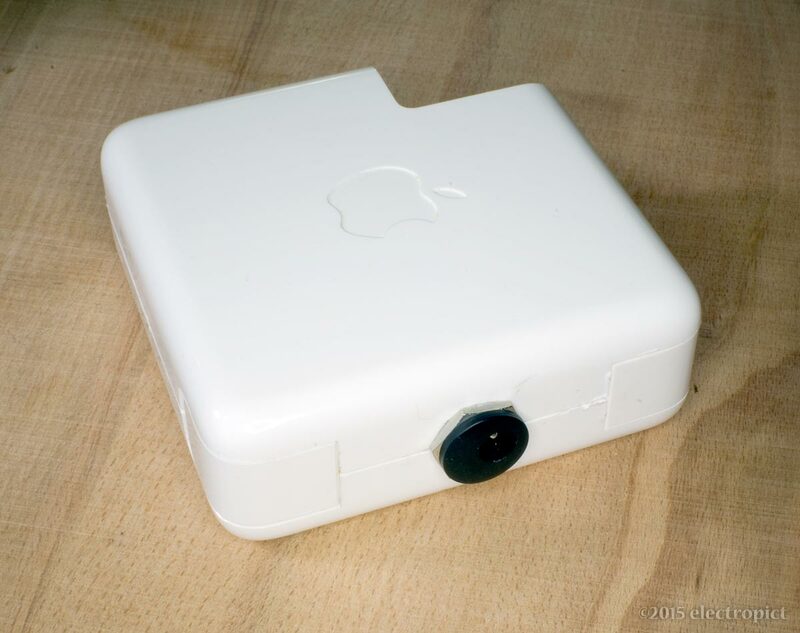 But it might be better than Appleʼs approach. 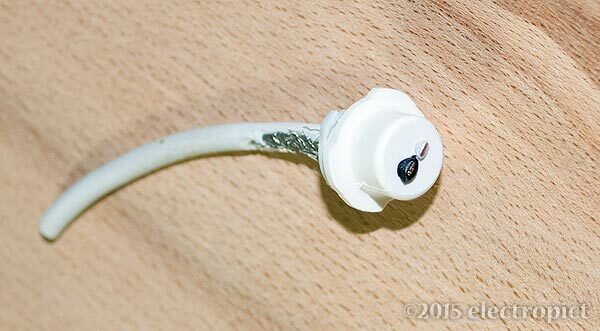 At the Adaptor end, since a 3·5mm jack would be a bit long, Iʼm going to try a simple coaxial connector. Getting the right one is difficult; it has to be small enough to fit into the case (though packing out with washers is an option) and simultaneously capable of handling the current and voltage. (4·5A @ 18·5V max. for these 85W PSUs.) I havenʼt been able to find an ideal one (with full specs), so Iʼve gone with the best available based on conductor areas. (As it turns out, the terminals inside look smaller than Iʼd like.) 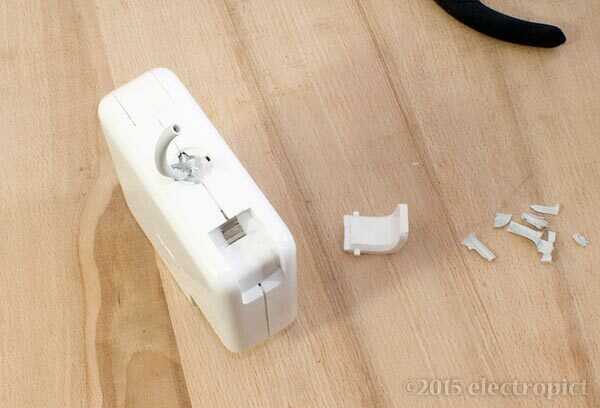 The supply pin is just – only just – recessed enough to avoid contact with external conductors, but the supplyʼs ELV. Iʼm not completely happy with this, but weʼll see. Prise the lower side of the case back a bit, solder the wires on, with heatshrink, and clip the nut in, screwed to the appropriate depth. All this would have been easier with more cable inside, so next time (Nº4) Iʼll try to get an extra inch or so by cutting the strain relief off completely, and resheath it. 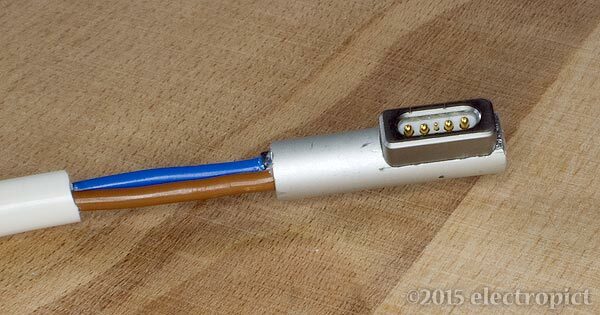 Or maybe desolder and replace the whole thing – though the cable is heavily soldered in, requiring a heavy soldering tip. Once in, the case can be reassembled. Still not sure whether it should be glued or not, but it snaps together. Whether it will stay together...? As for the cable, the replacement is 2-core 0·75mm2 H05V2V2-F. This is a bit thicker than Iʼd like, but I havenʼt found any lower-voltage-rated V2 flex in small quantities. 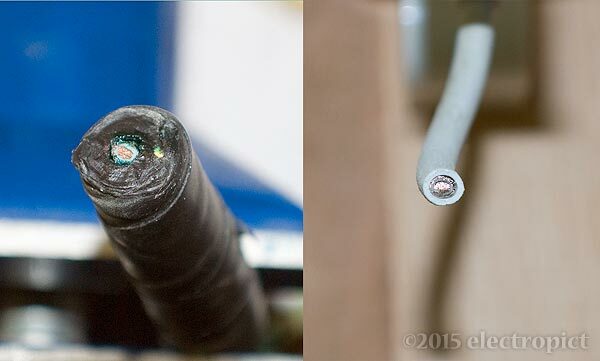 I donʼt know the temperature rating of the original cable, but Iʼd expect 60–70°, so V2 is probably best. This is experimental. 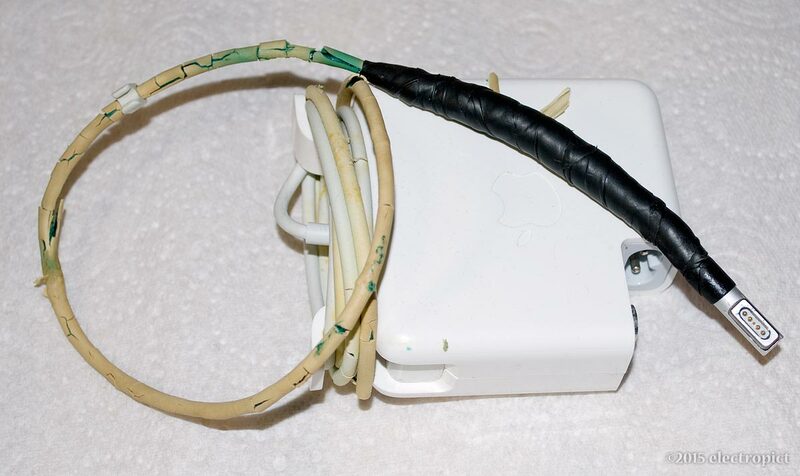 There are issues with the assumptions Iʼm making – as regards the cable, obvious ones are that EM interference out or in will not be a significant issue, and that the conductor temperature in the MagSafe tip really doesnʼt get much above 70°. Iʼd be surprised (not to mention scorched) if it did, but usual disclaimers about doing any of this in yr own home apply. I may also end up putting a ferrite on it, but not today. 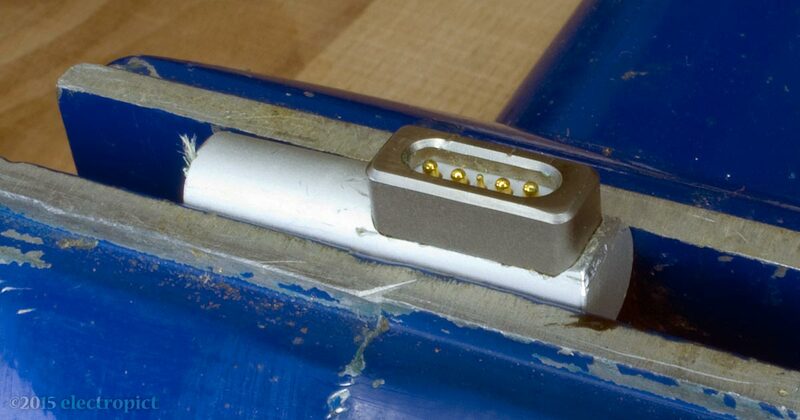 Tip: First, the connection pin assembly has to be removed from the aluminium cover. The grey rounded-rectangular thing is the magnet that holds the Tip in place; itʼs glued in, but it can be removed with care and pliers. The tip must be held firmly, so a mini-vice is very handy at this stage. In the picture below you can see that this MagSafe tip has a chamfered end; this is where I filed it down to allow reinsertion of the contacts the first time I resoldered it. With the magnet out, the contact pins can be gently pulled up and out with a fine and soft-edged pair of pliers or similar. It has to be pulled slightly back to free the retaining tab at the end before itʼs pulled up. Note that the red insulator visible in this picture is something I added last time; the original had a piece of black heatshrink in roughly this position. The light-brown patches are the glue I put the magnet back with (the original glue was white). Looking at this photo, I seem to have damaged the body slightly, probably while reinserting, since photos from the time donʼt show it. No functional harm though. It is not obvious from the picture how tight this is; filing the cover down helps. 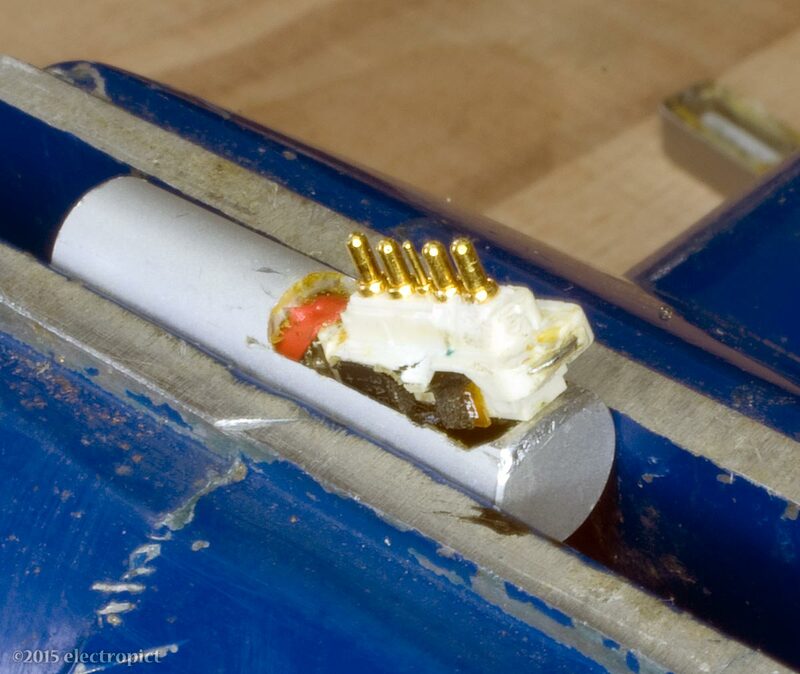 Once the corner of the connector assembly is out like this itʼs straightforward. With the old wire desoldered, the thing can be seen clearly. Actually, a magnifying glass is very useful at this point. The MagSafe tip contains several components which handle some of the power switching/indication functions on MacBooks. Soldering in this area is therefore a bit more hazardous than youʼd expect in an ordinary power connector. The main point to note here is that the core (supply) wire is soldered on the side with the larger chip – front in the right-hand image above, red heatshrink below. Ground is soldered on the other side (black below). (I forgot to prepare a larger piece of heatshrink to cover the soldering, so added a piece of tape again, after this pic. You donʼt want to risk contact with the tip cover.) This sheath is too large to fit into the cover, but both the insulated wires will go in, and only just pull through when soldered and heatshrinked. 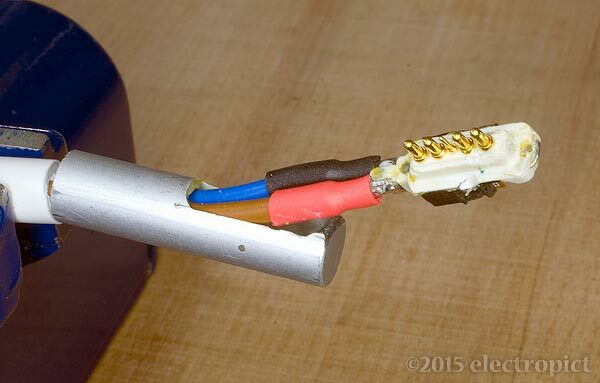 Itʼs tight enough (even with a little lubricant) that I donʼt think it would work with 1mm2 wire; if that became necessary for other reasons Iʼd probably need to strip a few cm of ground wire and wrap it round the supply wire – coaxial once more. But weʼll see how we get on. 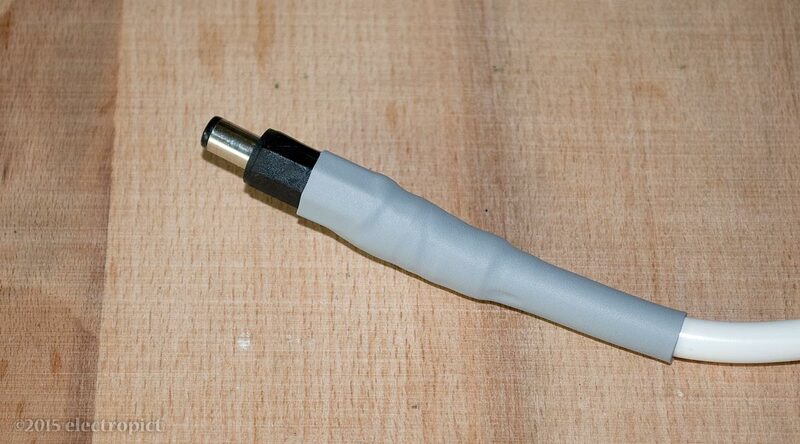 Once pulled through, I packed the gap with a modicum of self-amalgamating tape and added a heatshrink cover. It still doesnʼt look great (might have been better with the next size down of heatshrink – less wrinkly), but itʼs a big improvement on its previous state, or the current state of Nº4. Note that any more than about one thickness of heatshrink over the cover might prevent the plug from making proper contact; Iʼm not sure what the tolerances are. At the Adaptor end, the plug has a cover with moulded-in strain relief; this is too small for the cable so Iʼve cut it off. The insulated wires stick out a little at this end too, so Iʼve done the same – SA tape and heatshrink. Here Iʼm assuming it wonʼt get very hot, because there have been no previous signs of heat damage; so I didnʼt try to get a high-temperature set. The cable length is a generous fathom, which should be more than enough to dissipate heat from the other end even with heavier cable. As constructed, both ends are fairly rigid and straight at the moment, but they may soften in use. Obviously some will see this and think the cable is awkwardly thick. True. (Thinner would be better if you can get it; this really doesnʼt need 300V-rated cable.) It can be expected that it will sometimes part from the Adaptor socket. But itʼs not a problem. This is a battery charger. It comes out? You stick it back in and carry on. Preferable to it exuding stickiness, turning green, and crumbling to the touch, no? 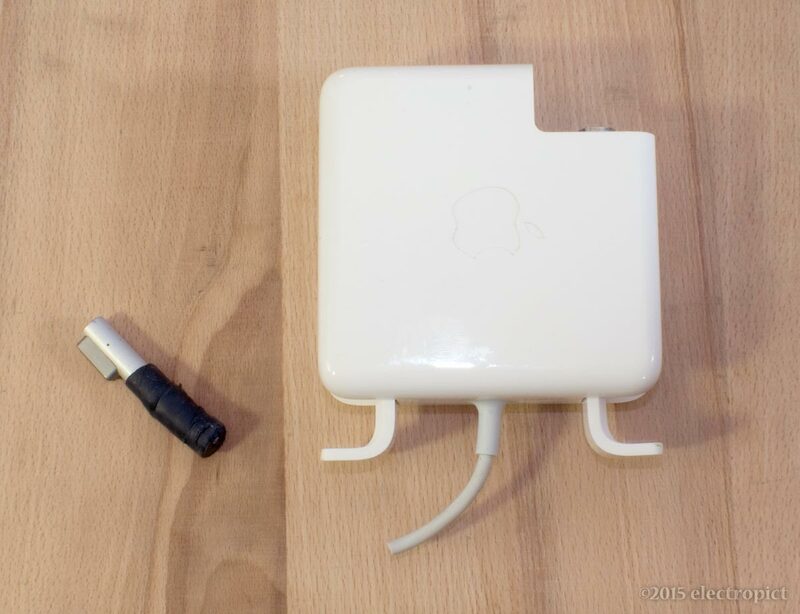 But – will it last without overheating the cable or either connector? Iʼll be keeping an eye on it, so in the absence of further updates, assume reasonable success.